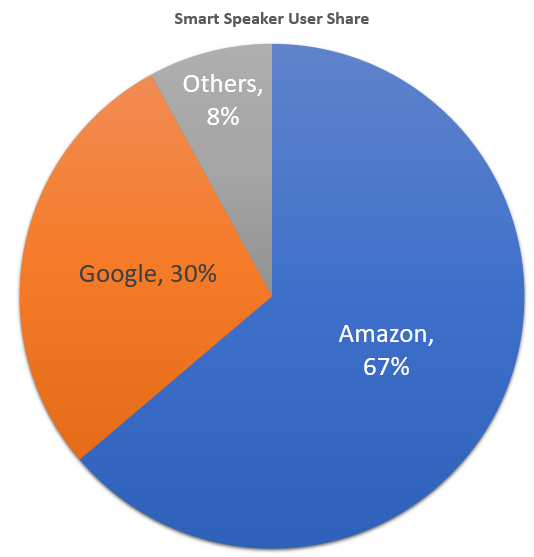 eMarketer just released its latest forecast for the smart speaker market in the US. It shows Amazon Echo's share has fallen slightly to 67%, due mainly from gains from Google, who sat at 30%. Wait! Where have I seen this 2/3 vs 1/3 pattern before? Ahh, yes, the desktop/mobile search engine market. Google has held about 2/3 of the total US search query volume on desktop and mobile for a while. And Bing/Yahoo! (or Bing/Oath I should say) has held on to about 1/3...more or less. Google is obviously not happy to have the tables turned in the smart speaker space, especially as voice search is the next frontier for the Search category! So they are making aggressive moves for its Google Home product, including a successful launch of its affordable Home Mini. Amazon is not kicking back either though. They keep adding more Skills each week to Alexa and striking more hardware vendor partnerships to embed Alexa. Amazon is also attacking Google on its own turf -- Search Advertising. According to a recent Forrester report, consumers are 2.5 times more likely to research products for purchase from Amazon than any other source, including Google. Amazon's ad business is also growing to take advantage of these Amazon search queries. In its recent fourth-quarter earnings, Amazon reported that “Other” revenue, which includes advertising, increased to $1.7 billion, representing 60% growth YoY. This will continue to grow and compete with Google's popular Product Listing Ads. So, while there's lots of talk about the Google-Facebook duopoly, don't count Amazon out just yet!